Update: The cloud chamber is currently not for sale – but is being re-engineered as a kit. See http://www.nothinglabs.com/cloudchamber/ for info on building your own! Cloud chambers let you see paths left by ionizing radioactive particles. Traces appear as the particles ionize super-cooled alcohol vapor – causing it to precipitate. Most cloud chambers require messy / inconvenient dry ice or other external cooling. They also need extended periods of time to reach operating temperature. The Nothing Labs Electronic Cloud Chamber uses a thermoelectric (“Peltier”) / air cooling system to quickly chill its surface plate to -30 Fahrenheit without dry ice. As far as I can tell – this is the first cloud chamber design that uses electronic / peltier cooling which doesn’t need external secondary cooling (like cold water). 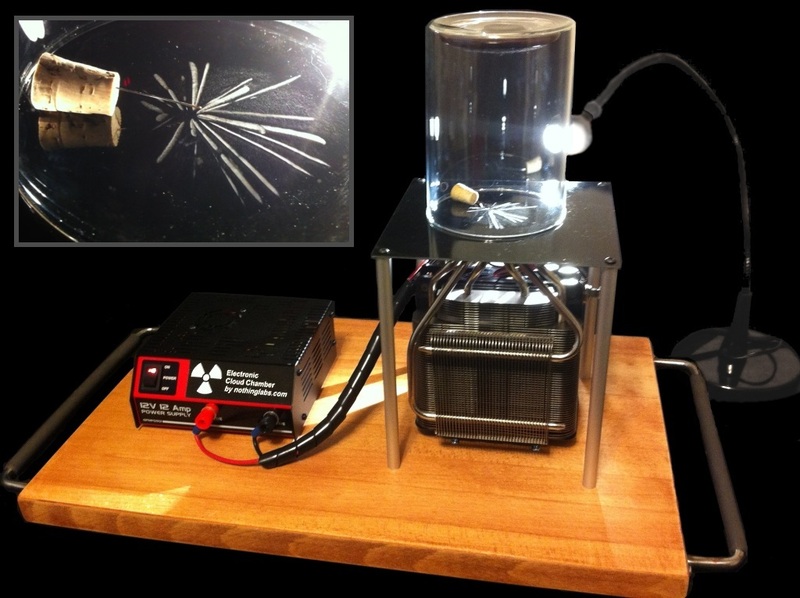 I came up with this cloud chamber in early 2010 – and promptly published most of my findings online. So – if your idea of a fun weekend involves thermal paste and heatsinks – check out the Instructable. Otherwise – I’ll build you a really nice looking one for a small fee.